I'm spending Saturday night sorting pictures on my hard drive. WOO PARTAY! It seems impossible that I would "forget" to blog something, but adventures are a high priority and writing time tends to get pushed aside in favor of more adventures (and home improvement). 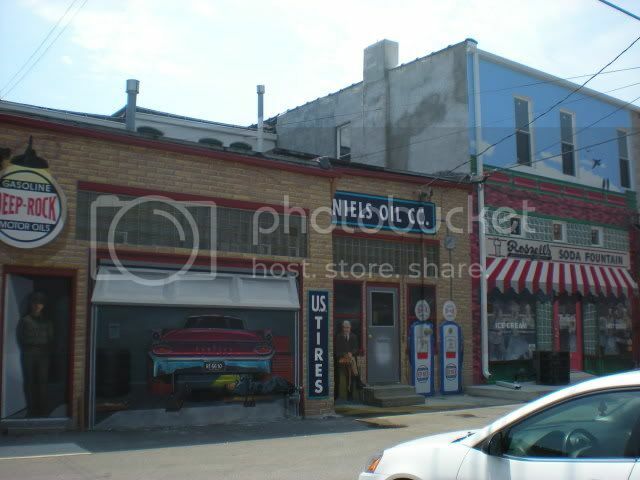 Sure enough, the first folder I opened contained more pictures from Pontiac, IL. You may remember the Livingston County War Museum from six months back. 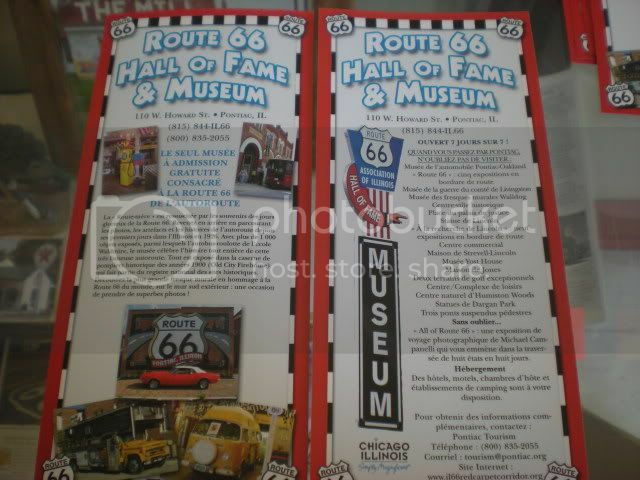 The Route 66 Hall of Fame and Museum shares the old fire station with them. The first thing we learned, from the welcome sign in a dozen languages and the guest book signed by some Swedes right before us, is that Route 66 is HUGE in other countries. This blows my mind. Obviously, I am very nostalgic when it comes to roadside attractions spawned by the Mother Road. 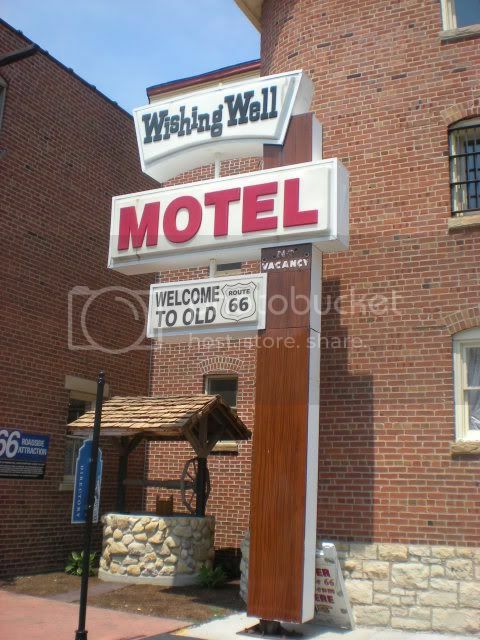 I've always wanted to do a Route 66 road trip, before it's too late for it to have any real appeal. I just have a hard time wrapping my brain around the fact that people from other countries are so obsessed with it that they plan their OWN vacations - international vacations - to check out the remnants of an American highway. I guess it's similar to the American obsession with Japanese pop culture. These are some awesome murals painted on the building behind the museum. This is just part of the series. 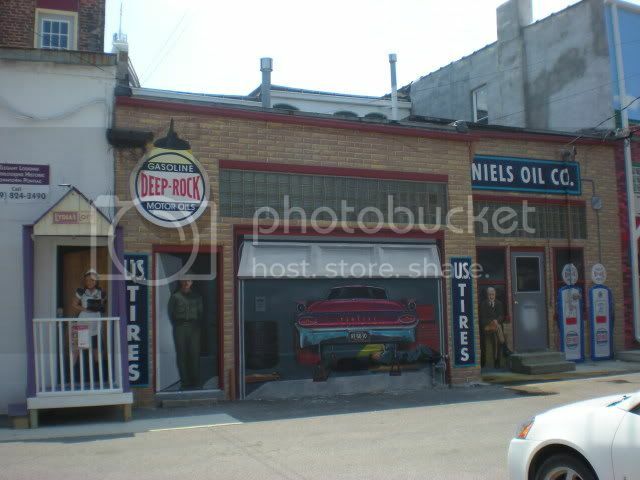 I'm guessing it's part of the Walldog Mural Museum, which I only just learned about on Pontiac's tourism website. 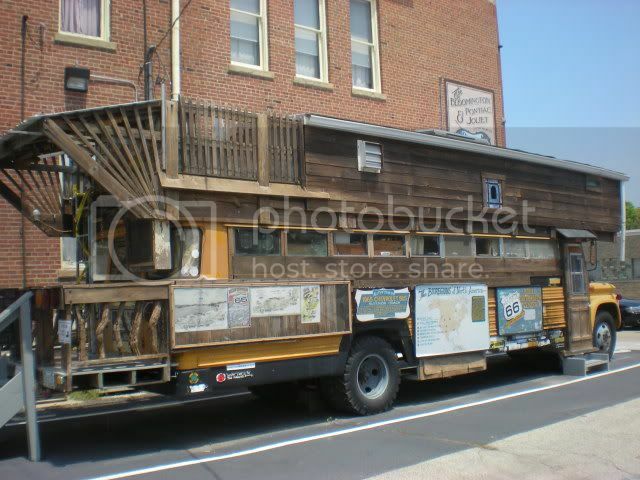 This is the Bob Waldmire School Bus Road Yacht. It wasn't open when we were there, but it's apparently pretty impressive inside. 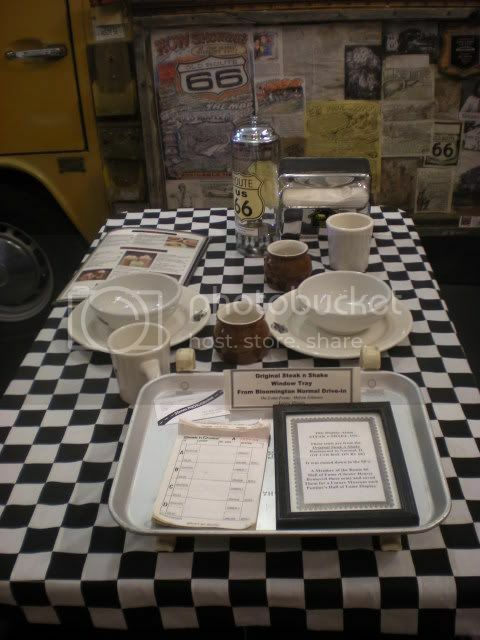 On our next trip to Chicago we will have to stop in Pontiac again, because they ALSO added a vintage car museum in the last year. 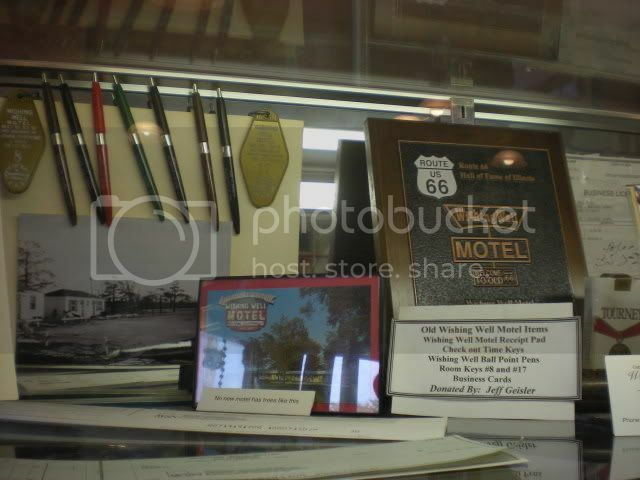 The museum itself is case after case of memorabilia collected from businesses and attractions all along Route 66, organized by region, so it's a virtual road trip you can do in an hour or so. 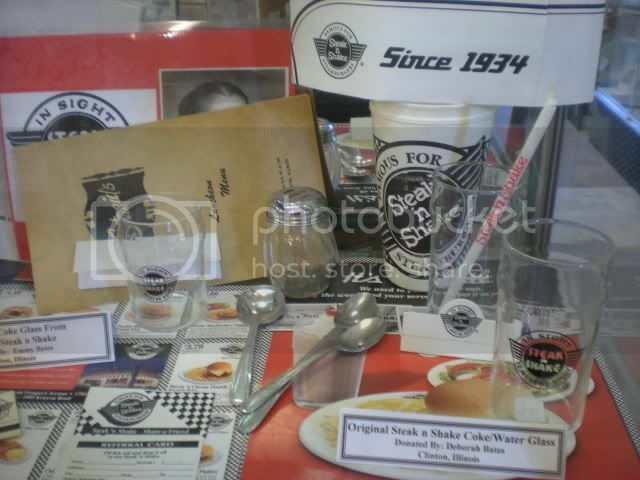 The extensive Steak N Shake collection made me laugh, because you know it was not hard to collect up an item here and there from a few dozen people, but how did someone steal a booth? Kidding, of course. 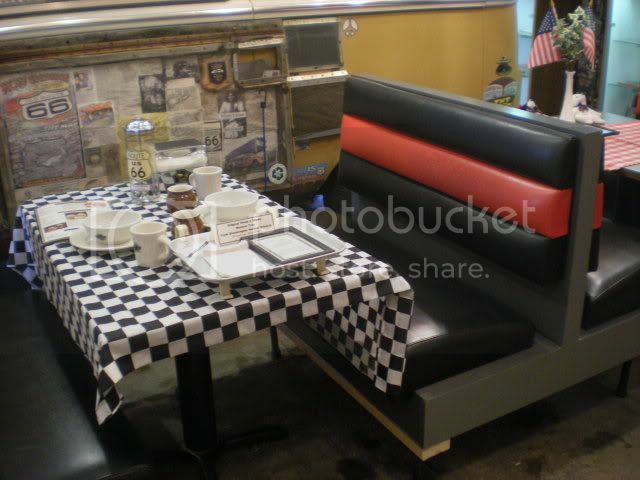 On the table is a sign that says that these booths were from the ORIGINAL Steak N Shake in Normal, IL and were saved by Chester Henry for future museum display. Nice foresight, Chester! You can see an old Steak N Shake diner from my neighborhood and read more about the history here. This is a fun one. Can you guess what this is? I'll give you a hint: If you are a parent of small children, you might recognize "him". Yes, it is Fillmore from Cars! 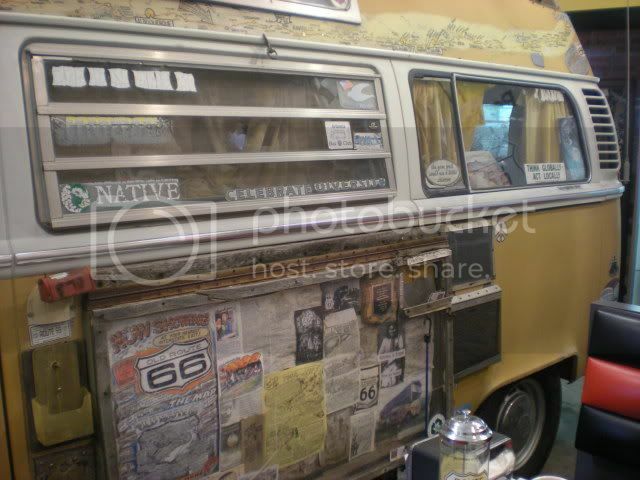 Otherwise known as Bob Waldmire's 1972 VW Microbus, the inspiration for Fillmore. 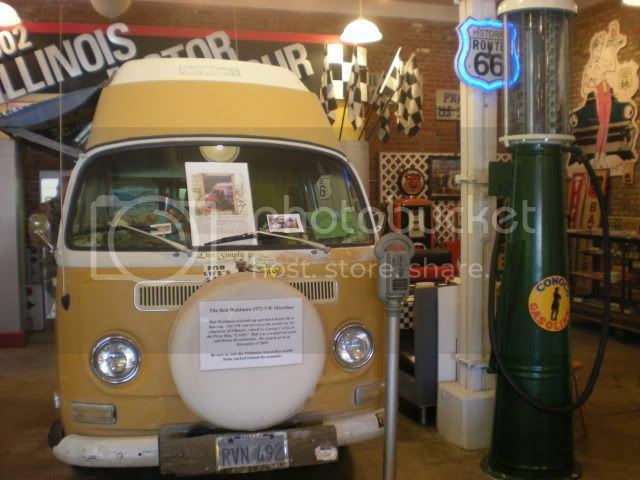 Bob was an artist and Route 66 enthusiast who died in 2009. The School Bus Road Yacht also belonged to him. 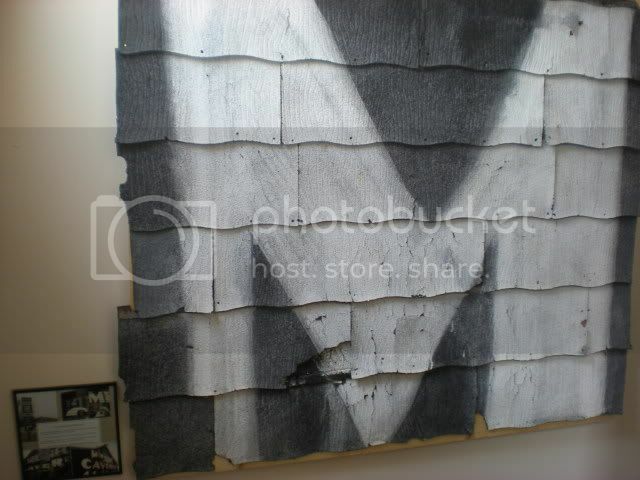 One more: It's an M from a Meramec Caverns barn sign! This is on the way up to the second floor, where there are tons and tons of pictures of various Route 66 restoration projects around the country and a photojournalism exhibit. Really neat stuff, but doesn't translate well to "blog". So next time you are driving to Chicago and see those giant billboards for Pontiac, believe me when I say it's worth a little detour! And stop at Cafe Fontana for a caprese grilled cheese sandwich! YAH! Driving Route 66 from Chicago to LA is my dream honeymoon.